Manav Rachna has always believed in the philosophy of societal upliftment as it carries forward the legacy of Founder Visionary Dr O.P. Bhalla whose philanthropic missions have been an inspiration for the entire Manav Rachna family. In keeping with the tradition of conducting Free Health Camps, Manav Rachna Educational Institutions under the aegis of Dr O.P. Bhalla Foundation conducted a Free Health Camp at Mohana Village. 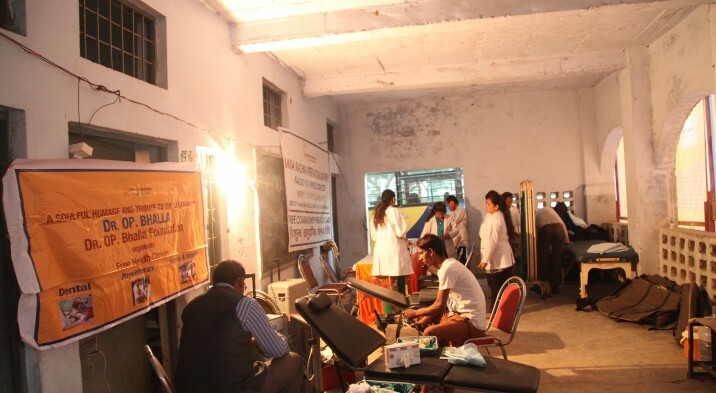 The Camp, a part of the ‘Khulla Darbar’ initiative being undertaken by the Deputy Commissioner of Faridabad, was conducted by Physiotherapy, Dental and Nutrition professionals to create more awareness about the need for a healthy lifestyle and hygiene. The MR Team members at the camp advised and assessed people suffering from knee problems, back and neck pain. Regular exercise, ergonomic advices and lifestyle modifications were emphasized upon to halt and alter the deterioration levels of the patients. People were given counseling on the role of proper nutrition and how a good diet can help in the treatment of various problems. The free Health camps at Manav Rachna are an integral part of the Corporate Social Responsibility initiatives regularly undertaken by Dr O.P. Bhalla Foundation from time to time and is a means to give villagers and people in the rural interiors access to free treatment for healthy living. At Khulla Darbar, where people’s problems were addressed towards the day’s end, the day long free health camp was a godsend and attracted huge crowds from Mohna village.